Deli ham and cheddar baked into fluffy, crispy Whole Wheat Ham and Cheese Scones. It’s an easy to make breakfast loaded with protein and just a bit of sweetness. 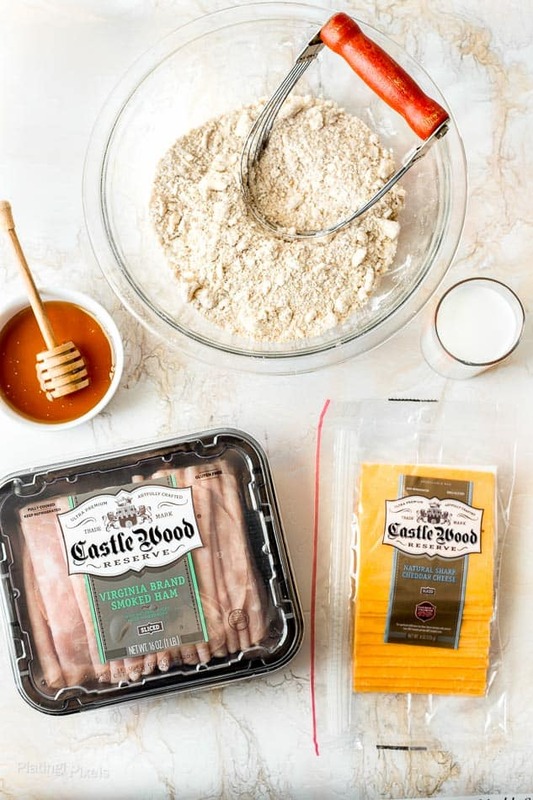 Deli meats and sliced cheeses are a convenient ingredient for busy families. I sure had my fair share of sandwiches in packed lunches growing up. There’s something pleasing about a flavorful meal that’s full of protein — all in one easy-to-go package. If you’re looking for something beyond your everyday sandwich then you’ll love these Whole Wheat Ham and Cheese Scones. It’s like a ham and cheese sandwich, but in a wholesome handheld breakfast. Scone are favorite breakfast treat of mine. They require little time to prepare and have unlimited flavor options. Usually mine are sweet like these White Chocolate Cranberry Scones and incorporate some sort of dried fruit, but felt a fun savory ham and cheese scone would be an ideal family breakfast. 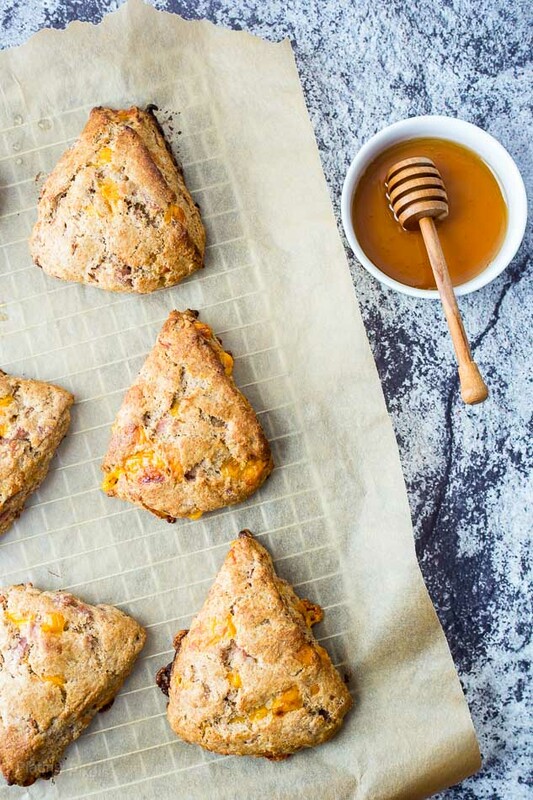 These Whole Wheat Ham and Cheese Scones are made with mostly common pantry items to create a fluffy, chewy and crispy treat that will put a smile on any face. Just a hint of honey in the dough compliments the savory ham. If you want to take the sweet and savory combo further, drizzle extra honey on top once baked. 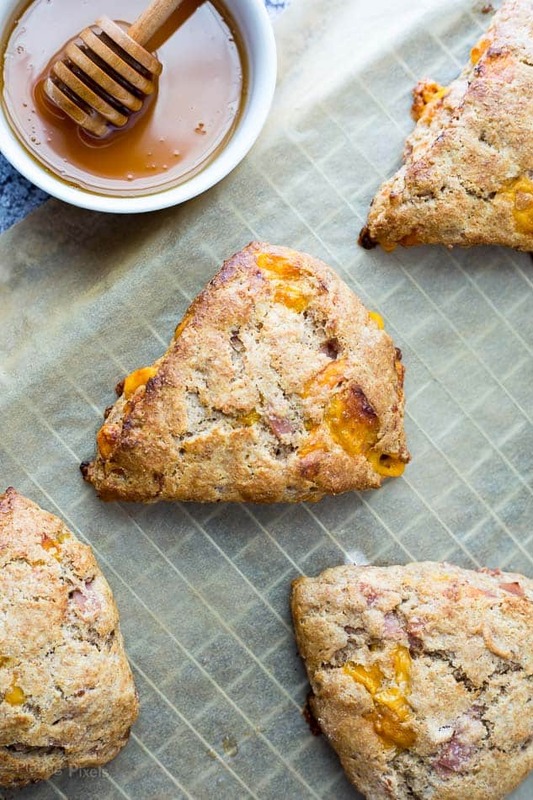 Enjoy these Whole Wheat Ham and Cheese Scones as a rewarding breakfast or easy family meal. It’s full of whole-wheat, ground flax seeds and protein for a nourishing, filling meal the pleasing to the eye and your tastebuds. 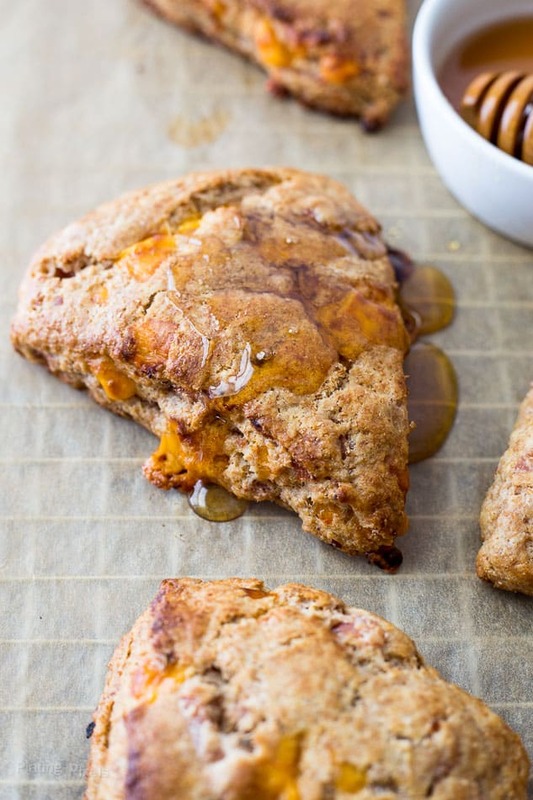 Flavor profiles: Meaty and cheesy baked into flavorful whole wheat scones with a hint of sweet honey. Texture: Soft fluffy center, crispy outside and gooey baked cheese oozing out, yum! Deli ham and cheddar baked into fluffy, crispy honey whole wheat scones. ⅜ teaspoon baking soda, just under half tsp. Preheat oven to 450 F° and line a baking sheet with parchment paper. In a large bowl whisk together flour, flax seeds, baking powder, soda and salt. Add cold butter and use a pastry cutter or hands to incorporate into mixture. It should be combined, with plenty of little bits throughout. Stir in ham and cheese, set aside. In a small bowl stir together buttermilk and honey. Stir into dry mixture, just until combined; adding a bit of buttermilk if needed. Mixture should be moist, but have consistency closer to a dough than batter. Place mixture on a lightly floured flat surface. Form into a ball and squeeze together to form a dough. Flatten dough with hands to 1-inch thickness. Fold in half, then flatten again into a 1-inch round, about 6-inches in diameter. Cut evenly into 6 wedges. Lightly coat tops with buttermilk, then place a couple inches apart on prepared baking sheet. Bake 14-16 minutes, or until tops are lightly browned (cheese that has oozed out will have a lovely brown as well). Cool on a wire rack slightly before serving. Store leftovers in fridge up to a few days. For best results, bake to reheat until warm and crispy. 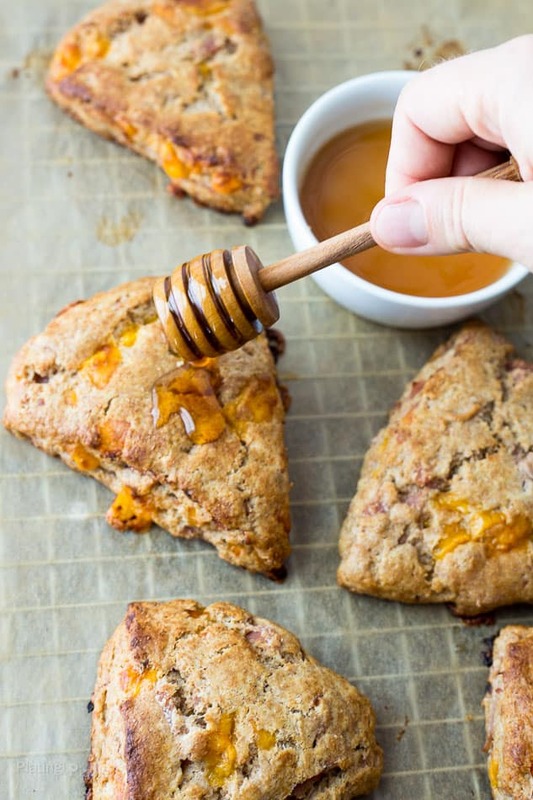 Savory scones are my favorite, and I love the little splash of honey on top! These look SO GOOD!! What a delicious treat to start the day, indeed! We need some new breakfast recipes around here. my boys would go nuts over these! These look Fabulous Matt and I so like the whole-wheat option. So much more healthier and perfect nosh. I am digging on these savory scones – and that honey drizzle??? Shut the front door!